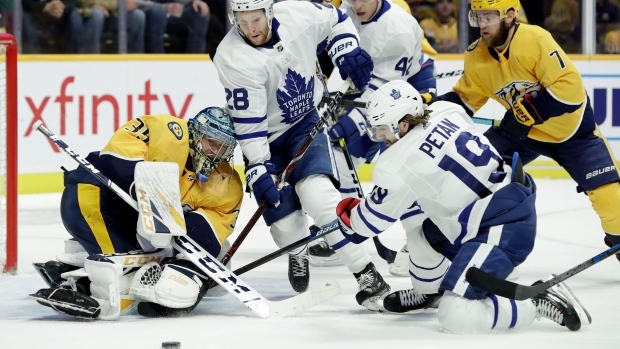 NASHVILLE — Pekka Rinne is starting to regain some of his Vezina Trophy form he showed last season. "It was a strong 60-minute effort and I thought we were good from the net out tonight," Simmonds said. "I think we're starting to gel. We've added a few pieces. Pekka is unbelievable, unreal. It seems like he just stops everything. Him and Juuse (Saros) are two of the best goalies in the league." NOTES: Toronto RW Kasperi Kapanen returned to the lineup after missing the previous four games with a concussion. ... Slumping Nashville C Kyle Turris was back in the lineup after being benched the previous two games. He played on the fourth line with LW Brian Boyle and RW Rocco Grimaldi. "(Brian Boyle) has seamlessly fit into our group," Predators coach Peter Laviolette said. "He's been a real valuable part of our play lately."